There are very few anesthesia groups that have historically participated in CMS’s group practice reporting option (GPRO) relative to PQRS; however, if you are considering this as an option for your practice in 2016, you still have until the last day of this month to notify CMS of your intent. As we have explained in multiple client alerts, compliance sessions, and other communications, Medac recommends anesthesia providers migrate to a qualified clinical data registry (QCDR) as the best assurance of avoiding both the PQRS penalty and the VM (value-based modifier) penalty in 2018. As a result, many of you have already transitioned to a QCDR. Interestingly, this is the first year that the GPRO has been extended to QCDR participation. Under a GPRO, regardless of the reporting model, CMS will be grading the group as if it were an individual. So long as the group—as a whole—has successfully reported on 9 measures, arising from 3 national quality strategy (NQS) domains, in at least 50% of the group’sMedicare cases, the group will avoid the penalties. The MAV process that I’ve addressed in previous alerts is available under most group reporting models (eg, registry, web interface, EHR) to help protect the group where the 9 measures and 3 NQS’s could not be met. With the QCDR GPRO option, however, there is no MAV available to shield you from the penalty. The group must hit these numbers. Only a group of 25 or more eligible providers may choose the web interface reporting option under a GPRO. If you are a group of 100 or more, registered as a GPRO, you must also participate in the Consumer Assessment of Healthcare Provider & System (CAHPS). This will entail paying for a third-party patient survey vendor, but successful completion of the survey will count toward 3 of the 9 required measures. For those of you who have opted for the QCDR model, and wish to participate under a GPRO, you have until June 30 to register. The group will first have to set up an “EIDM account.” To set up the account and register, go to the following website: https://www.cms.gov/Medicare/Medicare-Fee-for-Service-Payment/PhysicianFeedbackProgram/Self-Nomination-Registration.html. Once registered, CMS will count the PQRS measures reported by each individual in the group from Jan 1 to the time of registration toward the group effort under the GPRO. In other words, the individual’s PQRS efforts prior to GPRO registration will not have been in vain. The GPRO is not for everyone, but it remains an option—at least for a few more days. 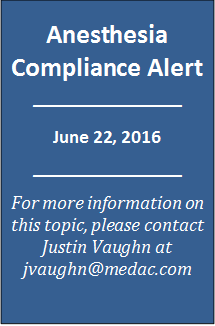 Please contact me or your Medac compliance liaison if you need further clarification.